As much as Germany’s strategy engendered mistrust in Germany’s neighbors, they certainly understood Germany’s needs. And so European strategy after World War II involved reshaping the regional dynamic so that Germany would never face this problem again and so would never need to be a military power again. Germany’s military policy was subordinated to NATO and its economic policy to the European Economic Community (the forerunner of today’s European Union). NATO solved Germany’s short-run problem, while the European Union was seen as solving its long-run problem. For the Europeans — including the Germans — these structures represented the best of both worlds. 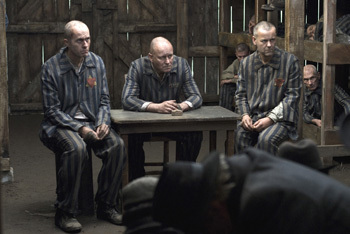 They harnessed German capital and economic dynamism, submerged Germany into a larger economic entity, gave the Germans what they needed economically so they didn’t have to seek it militarily, and ensured that the Germans had no reason — or ability — to strike out on their own. This system worked particularly well after the Cold War ended. Defense threats and their associated costs were reduced. There were lingering sovereignty issues, of course, but these were not critical during the good times: Such problems easily can be dealt with or deferred while the money flows. The example of a European development that represented this money-over-sovereignty paradigm was the European Monetary Union, best represented by the European common currency, the euro. STRATFOR has always doubted the euro would last. Having the same currency and monetary policy for rich, technocratic, capital-intensive economies like Germany as for poor, agrarian/manufacturing economies like Spain always seemed like asking for problems. Countries like Germany tend to favor high interest rates to attract investment capital. They don’t mind a strong currency, since what they produce is so high up on the value-added scale that they can compete regardless. Countries like Spain, however, need a cheap currency, since there isn’t anything particularly value-added about most of their exports. These states must find a way to be price competitive. Their ability to grow largely depends upon getting access to cheap credit they can direct to places the market might not appreciate. STRATFOR figured that creating a single currency system would trigger high inflation in the poorer states as they gained access to capital they couldn’t qualify for on their own merits. We figured such access would generate massive debts in those states. And we figured such debts would contribute to discontent across the currency zone as the European Central Bank (ECB) catered to the needs of some economies at the expense of others. All this and more has happened. We saw the 2008-2009 financial crisis in Central Europe as particularly instructive. Despite their shared EU membership, the Western European members were quite reluctant to bail out their eastern partners. We became even more convinced that such inconsistencies would eventually doom the currency union, and that the euro’s eventual dissolution would take the European Union with it. Now, we’re not so sure. What if, instead of the euro being designed to further contain the Germans, the Germans crafted the euro to rewire the European Union for their own purposes? The crux of the current crisis in Europe is that most EU states, but in particular the Club Med states of Greece, Portugal, Spain and Italy (in that order), have done such a poor job of keeping their budgets under control that they are flirting with debt defaults. All have grown fat and lazy off the cheap credit the euro brought them. Instead of using that credit to trigger broad sustainable economic growth, they lived off the difference between the credit they received due to the euro and the credit they qualified for on their own merits. Social programs funded by debt exploded; after all, the cost of that debt was low as the Club Med countries coasted on the bond prices of Germany. At present, interest rates set by the ECB stand at 1 percent; in the past, on its own merits, Greece’s often rose to double digits. The resulting government debt load in Greece — which now exceeds annual Greek gross domestic product — will probably result in either a default (triggered by efforts to maintain such programs) or a social revolution (triggered by an effort to cut such programs). It is entirely possible that both will happen. What made us look at this in a new light was an interview with German Finance Minister Wolfgang Schauble on March 13 in which he essentially said that if Greece, or any other eurozone member, could not right their finances, they should be ejected from the eurozone. This really got our attention. It is not so much that there is no legal way to do this. (And there is not; Greece is a full EU member, and eurozone membership issues are clearly a category where any member can veto any major decision.) Instead, what jumped out at us is that someone of Schauble’s gravitas doesn’t go about casually making threats, and this is not the sort of statement made by a country that is constrained, harnessed, submerged or placated. It is not even the sort of statement made by just any EU member, but rather by the decisive member. Germany now appears prepared not just to contemplate, but to publicly contemplate, the re-engineering of Europe for its own interests. It may not do it, or it may not do it now, but it has now been said, and that will change Germany’s relationship to Europe. A closer look at the euro’s effects indicates why Schauble felt confident enough to take such a bold stance. Part of being within the same currency zone means being locked into the same market. One must compete with everyone else in that market for pretty much everything. This allows Slovaks to qualify for mortgage loans at the same interest rates the Dutch enjoy, but it also means that efficient Irish workers are actively competing with inefficient Spanish workers — or more to the issue of the day, that ultraefficient German workers are competing directly with ultra inefficient Greek workers. The chart below measures the relative cost of labor per unit of economic output produced. It all too vividly highlights what happens when workers compete. (We have included U.S. data as a benchmark.) Those who are not as productive try to paper over the problem with credit. Since the euro was introduced, all of Germany’s euro partners have found themselves becoming less and less efficient relative to Germany. Germans are at the bottom of the graph, indicating that their labor costs have barely budged. Club Med dominates the top rankings, as access to cheaper credit has made them even less, not more, efficient than they already were. Back-of-the-envelope math indicates that in the past decade, Germany has gained roughly a 25 percent cost advantage over Club Med. The implications of this are difficult to overstate. If the euro is essentially gutting the European — and again to a greater extent the Club Med — economic base, then Germany is achieving by stealth what it failed to achieve in the past thousand years of intra-European struggles. In essence, European states are borrowing money (mostly from Germany) in order to purchase imported goods (mostly from Germany) because their own workers cannot compete on price (mostly because of Germany). 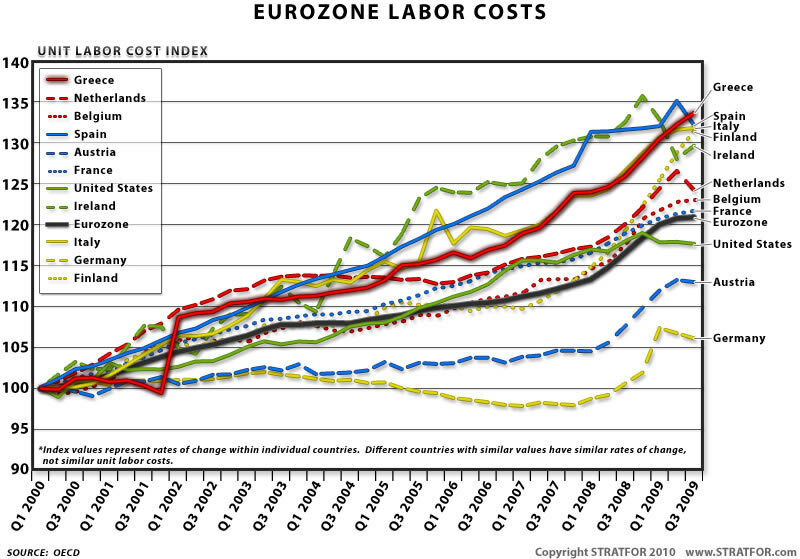 This is not limited to states actually within the eurozone, but also includes any state affiliated with the zone; the relative labor costs for most of the Central European states that have not even joined the euro yet have risen by even more during this same period. It is not so much that STRATFOR now sees the euro as workable in the long run — we still don’t — it’s more that our assessment of the euro is shifting from the belief that it was a straightjacket for Germany to the belief that it is Germany’s springboard. In the first assessment, the euro would have broken as Germany was denied the right to chart its own destiny. Now, it might well break because Germany is becoming a bit too successful at charting its own destiny. And as it dawns on one European country after another that there was more to the euro than cheap credit, the ties that bind are almost certainly going to weaken. The paradigm that created the European Union — that Germany would be harnessed and contained — is shifting. Germany now has not only found its voice, it is beginning to express, and hold to, its own national interest. A political consensus has emerged in Germany against bailing out Greece. Moreover, a political consensus has emerged in Germany that the rules of the euro zone are Germany’s to refashion. As the European Union’s anchor member, Germany has a very good point. But this was not the “union” the rest of Europe signed up for — it is the Mitteleuropa that the rest of Europe will remember well.